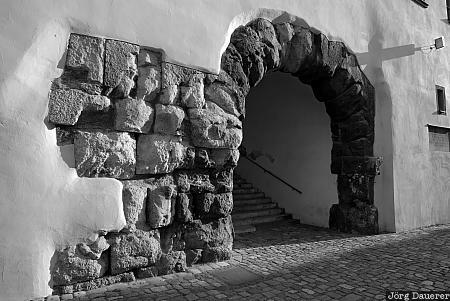 Parts of the old Porta Praetoria (the main gate to the roman castle) in Regensburg. Regensburg is the capital of the region (Regierungsbezirk) Oberpfalz in the east of in Bavaria, Germany. This photo was taken in the evening of a sunny day in June of 2010. This photo was taken with a digital camera.